"I love it! It's awesome!" Those were the words that rookie forward, Jake Guentzel, used to describe the feelings he had during his post game interview after recording his first career NHL hat trick on Sunday April 16 in game three versus the Columbus Blue Jackets. 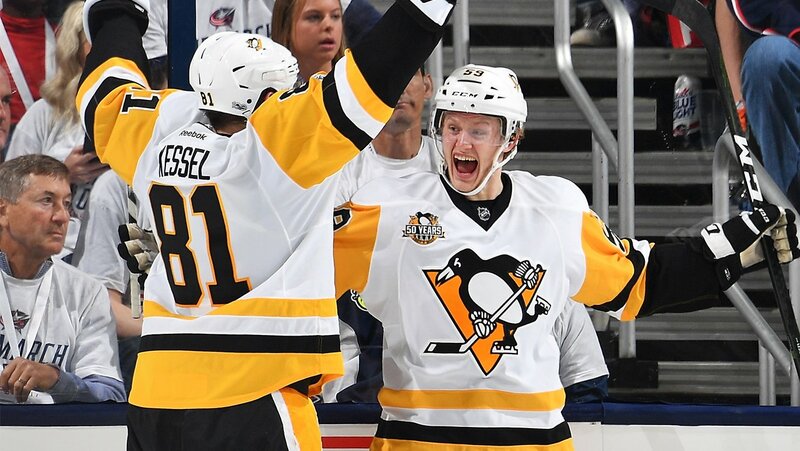 Once he scored the game winning goal, Guentzel became only the second rookie in NHL history to accomplish a playoff hat trick that included the overtime winner. That feat has not been done since Montreal's Gerry Plamondon in 1949. "It's still a blur," Guentzel continued, "'it's still crazy to think about". What is even more crazy is the fact that Guentzel is still only 22-years old and is playing with a hockey sense well beyond his age. The chemistry and intuitiveness built on the first line with team mates Sidney Crosby and Connor Sheary is something many teams dream of, but can rarely find. After the Penguins won game three and took a commanding 3-0 lead over the Jackets, Head Coach Mike Sullivan could not speak more highly of the young winger and his abilities. "Jake is mature beyond his years. He's got a quiet confidence that he's displayed since day one." HCMS continued saying, "I am sure there was a lot of hockey talk in his household growing up. His hockey sense might be his greatest asset." Going back and forth between the NHL and AHL can sometimes be tiresome. One would expect a little less pep in step skate, having to make the trips as often as Guentzel has this season. It seems, however, that there is no slowing down for this young man. While playing with both Penguins' teams, Guentzel has amassed quite the stat sheet. Over 76 games played, he has scored 41 goals and 39 assists for a total of 80 points (per Brian Metzer of Penguins Post Game). He has not even played a full season with the Pittsburgh Penguins but if this is an early indication of what Guentzel can do while being thrown from one team to another, it can only be imagined (for now) what he will bring when he plays all 80+ games. His list of achievements continued to grow on Tuesday April 18. When Guentzel scored on a rebound at the tail end of the contest, he became the first player since Maurice Richard (1944) to have five goals in his first four playoff games. The goal came with 0:27 seconds remaining in regulation which would end up coming a little too late to give the Penguins a chance to tie it and send the game into overtime, however the loss does not take the shine away from the incredible series Guentzel is having. For the time being, everything is coming up roses and it may even be coming from what has become sort of a good-luck ritual. Guentzel's daily conversations with Pens reporter, Michelle Crechiolo, seem to have the magic touch. Crechiolo made light of the "ritual" in her article published after the game three overtime victory. As the Penguins continue their march into the gruelling depths of the post season, it will be interesting and fun to see if Guentzel can keep the momentum going along with the rest of the team. The Penguins will look to finish out the Jackets in Game 5 on Thursday April 20 at 7pm back at home at PPG Paints Arena.